Hi, friends! Happy May! I adore this time of the year as the temps begin to rise, the days get longer and the calendar seems to get filled with more fun activities. With warmer temps, comes cuter fashion too (atleast I think so!) One of my favorite trends for Spring and Summer is definitely all the new ways to wear denim. I feel like chambray shirts were all the rage the past couple of years, so I love that now the focus has so much variety in the different styles. From cute jumpsuits & rompers, to frayed hemline skirts and to of course, my focus today, dresses. This ruffled bib apron style dress from Ulla Johnson was just too fun to pass up. I adore the fact that it has pockets and that the hemline is a bit frayed. It gives a rustic chic feel that I just love. It’s such a feminine take on denim! 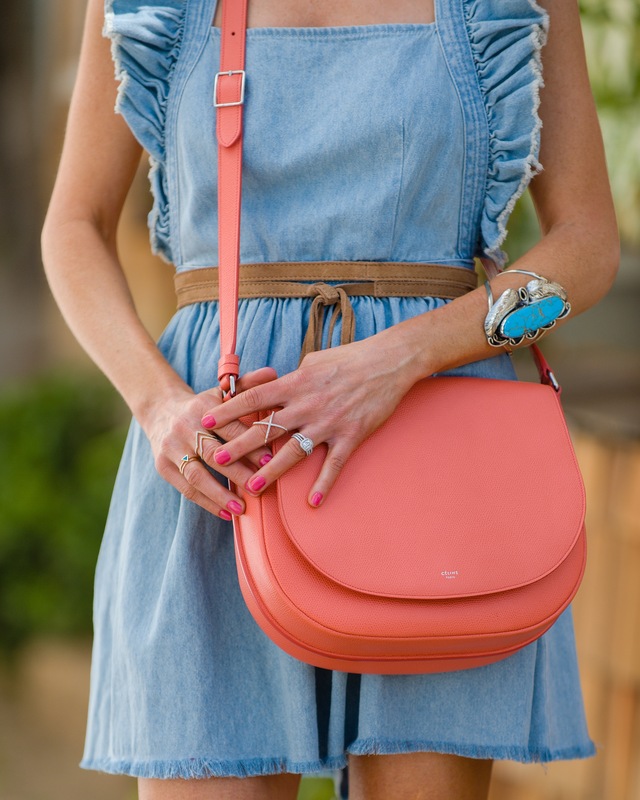 I paired it with this most fabulous coral salmon crossbody from Celine. Do you die or do you die over this bag? I can’t even explain in words how much I adore it. The most perfect rough texture and the color is just everything. Definitely the perfect POC to this look. I added this belt from Lovers & Friends just (because that’s what I do) to give the look a bit more personality and to break up the denim. For shoes, I went neutral with these embellished and super fun mini heels from Jeffrey Campbell. I am sad to say these seem to be pretty sold out everywhere, but a similar styles can be found here. (I only got these about a month ago, but apparently they are really popular!) I love love coral and turquoise, so I had to add on my oversized cuff from Natalie B. I can’t stop this beauty! This trend is SO wearable and SO easy. I found these other version below and from my search I can tell you that almost every designer has their own take. Have fun with it and chose a fit that you feel comfortable in! I think adding a belt to basically all of these is imperative, but it’s also about wearing what feels good to you, so wearing any of these as is, is fab too! I hope you are all having a great week so far and have a fab fab day today!